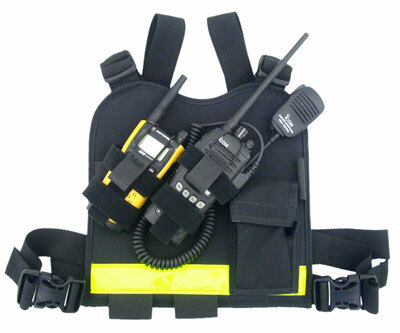 This radio chest harness provides you with a number of ways to hold and stow away items needed duringa crisis situation. Two adjustable radio holders. A pouch for gloves or additional radio batteries.External pen/pencil holders. Excellent for Amateur Radio Operators, RACES etc. during emergency communications incidents. Elastic loops for securing a flashlight or glow sticks. An internalpocket for maps or notebooks. A zippered pouch for smaller items. The harness is held in place withadjustable waist and shoulder straps and has a reflective strip for higher visibility.. This radio holster set expands to 62" so it can fit over bulky clothing, turnout coats etc. The shoulder straps expand to 21 -1/2"